The Cumberland & Dumfriesshire Farmers Mart had forward 7039 store lambs at their sale at Longtown on Tuesday 26th October, 2010. A large show of stores attracted buyers from all over, with trade again animated. Top was £66.50 for Texels from Chapel House, others £66 Rinnion Hills, £64.50 Highloveladyshield. Suffolks £64 Albierigg, £63.50 Allenheads, £61.50 Kilncroft; Cheviot Mules £57.80 Routin Lynn; North Country Cheviots £58 Routin Lynn; Greyfaces £62.50 Greensburn, £60 Sheepriggs, £59.50 Yatesfield; Beltex £57 Upper Ashtrees; Blackfaces £61 Horseholm, £60 Tecket; Zwartbles £55.50 Viewfields; Swaledale £44.50 Keilder Head, £40.60 Hesleywell, £39.50 Whitton. Hill Cheviots (2,256) were another good entry, buyers were plentiful and trade very similar. Top was £59.50 Granton, £59.20 Alnham Castle Hill, £57 Tushielaw, £56.20 Skelfhill. The overall average was £50.04. 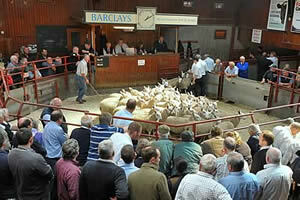 The Cumberland & Dumfriesshire Farmers Mart had forward 2757 breeding sheep at their late sale at Longtown on Tuesday 26th October, 2010. A large show for the time of year attracted a exceptional large crowd of buyers from a wide area. Trade was electric with all classes meeting a buoyant trade. Top was £100 for correct Texel ewes from Longrow, others to £96 Wallholm, £91 Bayles. Greyfaces £95 Longrow, £92 Archerbeck, £88 Wallholm; Hill Cheviots £89 Alnham Castlehill, £74 Bayles; Blackfaces £59 Lane House, £58 Damhead, £57 Alnham Castlehill, £55 Meikledale; Zwartbles £70 West Craigs; Herdwicks £50 Farlam Hill; Swaledales £62 Coldshield. Shearlings to £128 for Greyfaces from Longrow; Hill Cheviots £60.50 Barrowburn; Blackfaces £76 Nixon Terrace. Ewe lambs to £82 for Greyfaces from Longrow, £76 Sunnyside; Texels £76 Cubby Hill; Beltex £66 Farlam Hill; Suffolk x £75 Boreland; Hill Cheviot £62 Oakwood Mill, £54 Alnham Castlehill, £53 Mount Benger; Swaledales £67 Stobbylea; Blackfaces £48 Penpeugh; Cheviot Mules £55 Poolebank. Included in the sale was the dispersal of 611 mainly Swaledale sheep from J K Renwick, Grassfield, Nenthead, Alston. These created a lot of interest and highly satisfactory prices were obtained. Swaledale gimmer shearlings made the top price of £104. Ewes (1 crop) £80; (2 crop) £88, £84; (3/4 crop) £87, £85, £82. Leicester rams to £1000, £800, £750. Leicester ewe lambs £78. Greyface ewe lambs £81. The Cumberland & Dumfriesshire Farmers Mart had forward 212 rams at their late ram sale at Longtown on Tuesday 26th October, 2010. Buyers were keen and out in numbers, but as always the best were easily sold. Top was £1000, £800, £750 for Leicesters from Grassfield; Texels £500, £480 Kirkton; Suffolks £320 Lands, £300 Catslackburn & Guards Mill; Charollais £240 Woodfoot, £220 Braithwaite Hall; North Country Cheviots £240, £210 Naddle; Swaledales £150 Naddle; Oxfords £100 Guards. Rams lambs to £360 for Charollais from Springfield Farm; Suffolks £240 Nixon Terrace; Texels £300, £260 Kirkton, £290 Sandilands; Zwartbles £100 Viewfields.